‘Park Hill Mansion’ was one of several very large properties situated on Streatham Common North, in southeast London. They were once the homes and estates of some very wealthy people – providing, as they did, a commanding view over Streatham, and to the heights of Wimbledon and the Surrey Hills beyond. The owner of ‘Park Hill’ during the early 1870s was William Leaf – a successful London soft goods merchant who specialised in silks and ribbons – who made extensive additions and alterations to the house and grounds before he died in 1874. Many entrepreneurs of those days dreamt of owning a house on a hill, with its own grounds, a lake, and a folly, so, given that he already had a house on a hill, with its own grounds and a lake, it is hardly surprising that he should want to complete the set. 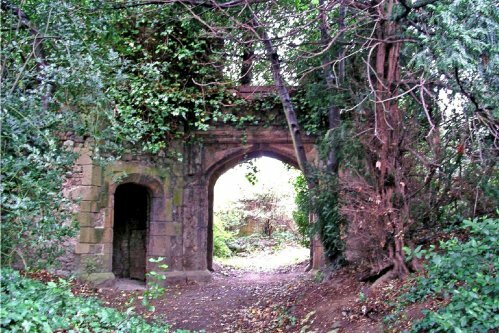 At ‘Park Hill’, his folly took the form of a ruined mediaeval gateway and tower. He assigns the date of 1873-74 for this work, which means that William Leaf never lived long enough to enjoy it. He died soon after the work was completed, and, in 1880, the estate was purchased by Henry Tate, founder of the Tate Gallery, and proprietor of the famous sugar company that is now known as Tate and Lyle Ltd.
All but roughly 5½ acres of land surrounding the house were sold off over the years, but improvements to the girls’ living accommodation were made during the 1970s. Funding and support for such large residential establishments as Park Hill ceased in the mid 1990s when the Government introduced its ‘Care in the Community’ legislation, and the Nuns were eventually left with little option but to find something smaller. The property was on the market for some time before its eventual sale to a consortium of property developers in 2002, but the Grade II* listing of the mansion as a building of special architectural and historic importance ensured its survival, and it has now been extensively renovated and refurbished as a private residence. These are the words of Daphne Marchant, co-author of Park Hill, Streatham, a booklet published by The Streatham Society in 2004, and on which the above historical notes are based. ‘Not all Pulham’s work met with unanimous approval from his contemporaries. Henry Tate’s Streatham residence was voted noble by Robert Marnock, and his garden charmingly laid out in the ‘natural style’ by Marnock, with fine specimen trees, and lawns sloping to a miniature lake. 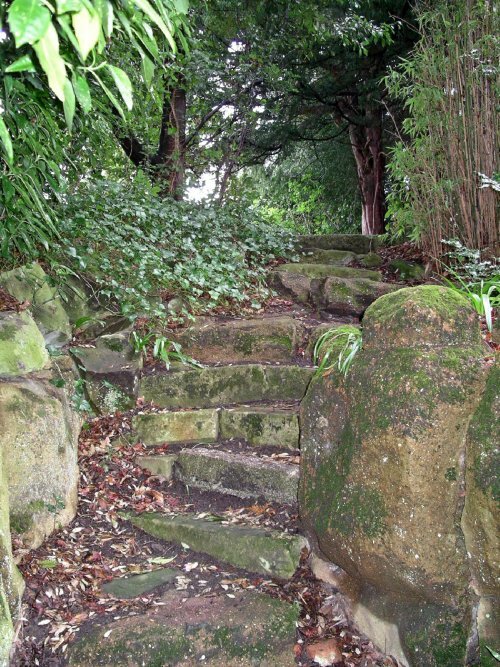 But the sunk path, in imitation of a rocky ravine which formed one of the boundaries, was not considered a success by William Goldring of The Garden in 1886-88. 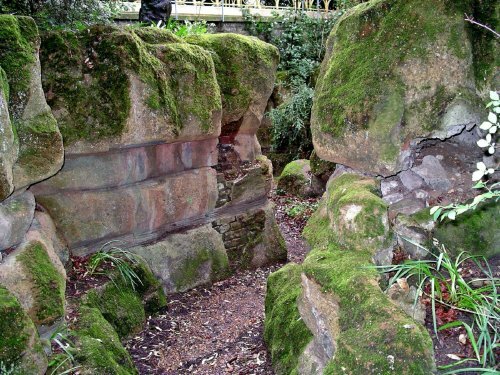 It was a ‘decidedly important feature,’ and enhanced by the growth of trees and shrubs, yet the ‘profusion of rocks’ looked undoubtedly artificial. Whilst browsing the internet, I came across another short article about the gardens at St Michael’s Convent. This was written by Cheryl Markovsky,[iii] who wrote that one of the Nuns’ design contributions was to turn the woodland ‘secret garden’ into a Garden of Gethsemane grottos, complete with a statue of the crucified Christ. The ‘ruined tower’ is in a separate corner of the grounds, and, as can be seen from Fig 1, is now covered by overgrowth and not easy to photograph, but the walls of the tower have traditional mediaeval ‘cross slit’ windows, and it is possible to enter the single rooms on both floors. Unfortunately, most of the panoramic views from the upper floor are now obscured by nearby buildings, but it is intriguing to imagine what a vantage point this must have been all those years ago. 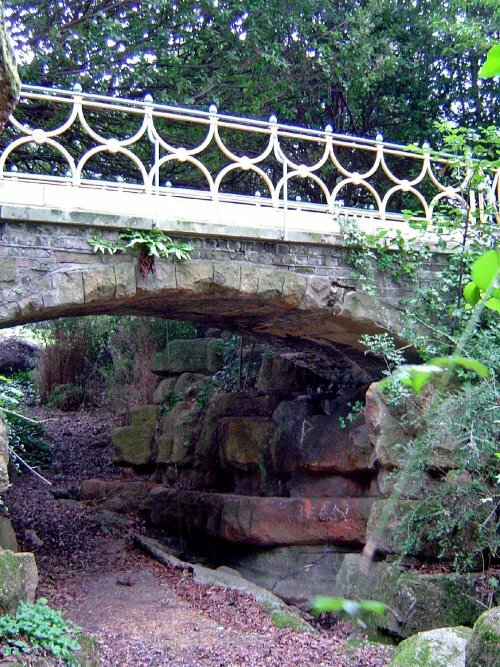 It is a short walk from here to the arched bridge over the ‘rocky ravine,’ which can be seen here in Fig 2. 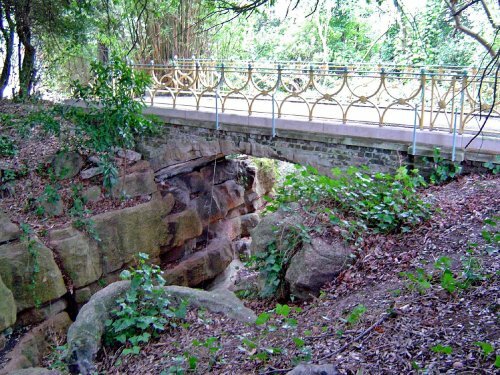 There are planting pockets along the top of the bank, and in the cliffs themselves, and there are also the remains of some – but not much – ashlar surfacing to the brick facing of the bridge itself. The railings are a faithful replacement copy of the original balustrading, which is thought to have been designed especially for William Leaf by John Bounaroti Papworth. One or two of the rocks have terrible splits and cracks in them, caused by the growth of trees that, in most cases, will have self-seeded many years ago. It is difficult to know what best to do for them at this stage, because to leave them will inevitably result in the damage getting worse over time, whereas to try and remove the tree roots might destroy the rock altogether. A short way further along is the section of the walkway that Cheryl Markovsky says the Nuns referred to as ‘The Caves.’ It is a collection of grottoes that they converted into religious shrines by adorning them with statues, and it is easy to imagine how peaceful, and how suitable for their meditations it would have been for them here. 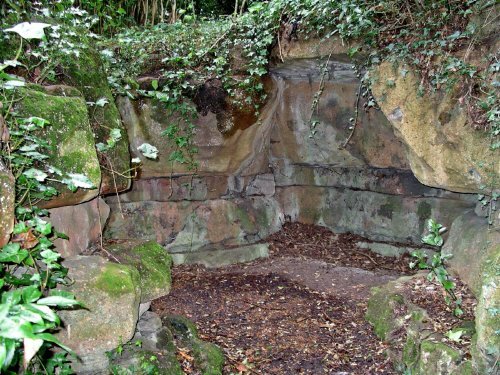 The statues have naturally all been removed by now, but one of the empty grottoes is pictured here in Fig 5. Rounding a corner, on the way back towards the bridge, there is an area of rockwork from which the top surfacing has broken away. It is shown here as Fig 6, and it is noticeable that the bricks used in the base structure of these rocks are slightly smaller than the house bricks that are normally used today. Finally, back at the bridge itself, one can clearly see the rockwork beneath, and extending away up the slope beyond. The remains of the channel along which ran the stream that was fed from the lake can also be seen clearly in Fig 7. From here, one can return to the grand terrace along the front of the mansion, but almost all of the vases and sphinx-like models that now top the boundary wall are copies or the originals that were stolen a few years ago. It is impossible to claim positively that the originals were by Pulham, but it must be a strong probability. This site is still in quite good condition, and is well worthy of some proper restoration and subsequent regular maintenance. One can only wish all the residents of Park Hill Mansions every possible success in bringing this particular piece of our Pulham heritage back to life. [ii] ‘Great Credit upon the Ingenuity and Taste of Mr Pulham,’ by Sally Festing. Garden History -+Society Newsletter 1988 Vol 16/1 Pages 96-97. 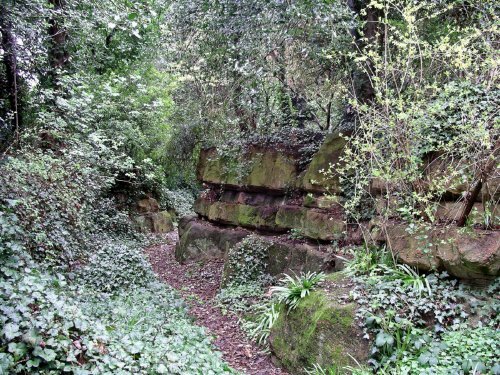 Posted on July 1, 2012 June 4, 2016 by Claude HitchingPosted in Sites Month 2Tagged . . James Pulham and Son, fernery, folly, Grottoes, Henry Tate, Park Hill Streatham, Pulham bridge, robert marnock, St Michael's Convent, William Leaf.